. [PONT121] King Adalric of the Ardennes m. ?
. . . . . . . . . . . [PONT231] Count Helgaud I of Cotes Maritime m. ? [PONT121] Adalric (son of [CLOD141] King Clodius of the Salian Franks, see SALIAN FRANKS), was King of the Ardennes. [PONT131] Waudebert I, Count of Ardennes, married Lucille. [PONT141] Waudebert II de Lommois married Amalberge von Thuringia. [PONT151] Waudebert III de Lommois married Clothilde d'Ostrogoth. [PONT161] Waudebert IV de Lommois married Amalberge de Landen. [PONT171] Waudebert V de Lommois (born 635) married Berthilde von Thuringia. [PONT181] Waudebert VI de Lommois (born 665) married [VINC182] Adeltrude (daughter of [VINC171] Count Vincent Madelgaire of Hainault & [LOMM172] Wautrude de Lommois). He died 704. [PONT191] Waudebert VII de Lommois (born 695) married Aldegonde von Bavaria. He died 725. PONT201] Waudbert VIII de Lommois (born 725) married [PONX202] --- (daughter of [PONX191] Thierry II de Ponthieu, son of [PONX181] Walmar de Boulogne, son of [PONX171] Walmar de Boulogne). He died 762. [PONT211] Angilbert (born c.750) had an illicit relationship (in the 790's) with [CARO254] Berthe (daughter of Charlemagne, see CAROLINGIAN HOUSE). Angilbert was a Count, later Abbot of St. Riquier, and died February 814. He was also a poet and was nicknamed Homer at Charlemagne's court. Berthe died after 823. [PONT222] Arsinde (daughter of Angilbert de Ponthieu & Berthe) married [REIM261] Count Remy (see REIMS (2)). [PONT231] Helgaud I (son of Angilbert) was Count of Cotes Maritime, and died c.876. [PONT241] Herlouin I, Count of Montreuil, married Helesinde de Montreuil. [PONT251] Helgaud II, Count of Ponthieu & Montreuil, married Gisla du Maine (daughter of Count Gauzelin of Maine). He was living 925. [PONT261] Herlouin II, Count of Ponthieu & Montreuil, married Hildegarde d'Amiens. He was killed in battle 13th July 945. [PONT281] William I, Count of Montreuil, married 1. ---; then 2. [BOUL292] Maud de St. Pol (daughter of Count Adalolf, see BOULOGNE COUNTY). [PONT291] Hildouin (son of William & Maud), Count of Arcis-sur-Aube, married Dame Hersende de Rameru. He was living 984. [CHAR301] Hildouin, Count of Breteuil (son of Hildouin) married Emmeline de Chateaudun (born 974, daughter of Vicomte Fouche de Chartres), and thereby became Vicomte de Chartres. [CHAR312] Adela (born 1000, daughter of [CHAR301] Hildouin married [VALS311] Count Ralph II, see VALOIS COUNTY). [PONT301] Hughes I (son of [PONT291] Hildouin) was Count of Montreuil, and Seigneur de Ponthieu. He married (before 987) [CAPE323] Gisle (daughter of [CAPE311] Hugh capet, see CAPETIAN HOUSE). He died 4th July 1000. [PONT312] Elisende (born c.995, daughter of Hughes I, married [SPOL321] Count Hughes (born c.990, see SAINT POL). [PONT311] Engherand I (son of Hughes I), Avoue de Saint-Riquier, Count of Ponthieu, married [HOLL329] Aleida (widow of Count Baldwin of Boulogne see BOULOGNE COUNTY, daughter of Count Arnulf, see HOLLAND COUNTY), and was living 1043. [PONT321] Hughes II was Count of Ponthieu, and Seigneur de Abbeyville, married Berthe (daughter & heiress of Sire Guerinfrid de Aumale, who built the castle there). Hughes was killed 20th November 1052, and afterwards Berthe married 2. (1053-54) Count Lambert of Lens; then 3. (1060) Count Eudes II of Champagne. [PONT339] Enguerrand II (son of Hughes II) had a relationship with [CONT329] Muriel (half-sister of William the Conqueror and sister of Bishop Odo of Bayeux, see CONTEVILLE). Enguerrand then married [NORM338] Adelais (illegitimate daughter of DUKE ROBERT II OF NORMANDY & Herleva, see NORMANDY DUKEDOM). Enguerrand was killed at the Siege of Chateau d'Arques (25th October 1053), and afterwards Adelaide married 2. (c.1053-54) [LENS331] Count Lambert (see LENS), killed 1054; then 3. (c.1058) [AUMA331] Count Eudes III (see AUMALE COUNTY). [PONT345] Helisende (daughter of Enguerrand II & Adelais) married [SPOL351] Count Hugh II (see SAINT-POL). [VALO421] Piers de Valognes (born c.1049, illegitimate son of Hughes II & Muriel) is described under VALOGNES. [PONT341] Guy I (son of Enguerrand II & Adelais, [and the Chronique de Saint Riquier which refers to "comte Gui fils du comte Hugues" is believed to be erroneous]) married 1. Ada d'Amiens-Valois, died before 1066; then 2. Adila (Ada). He was 8th Count of Ponthieu. [Ada and Adila may be the same person.] Adila died 6th October 1100, and Guy died a month later (13th November 1100). [PONT352] Agnes (only daughter & heiress of Guy, by Adila), Countess of Ponthieu, married (before September 1087) [TMON341] Earl Robert (see SHREWSBURY (MONTGOMERY) EARLDOM). [PON1351] William Talvas (only son & heir of Robert) married (c.1115) [BURG332] Ela Borel (daughter of DUKE EUDO I, see BURGUNDY (HOUSE OF CAPET) DUKEDOM). (Ela had previously married 1. Bertrand, Count of Toulouse.) William became Count of Ponthieu. In 1135 King Henry I confiscated William's Norman lands, whereupon William joined DUKE GEOFFREY V OF NORMANDY with whom he invaded Normandy after the death of King Henry I, and the accession of King Stephen. Ela died 28th February 1141, and William died 30th June 1171. [PON1369] Ela (daughter of William Talvas) married 1. [SURR431] Earl William (see SURREY (WARENNE) EARLDOM); then 2. [SALI361] Earl Patrick (see SALISBURY (SALISBURY) EARLDOM). [PON1364] Clemence (daughter of William Talvas) married [MAYE361] Seigneur Juhel (see MAYENNE). [PON1361] Guy II (born c.1118, son of William), Count of Ponthieu, married Ide de Saint-Pol. He died of sickness at Ephesus (25th December 1147). [PON1381] John I (born c.1140) married 1. Mauhaut; then 2. Laurea (daughter of Seigneur Bernard III de Saint-Valerie, see SAINT-VALERIE); then 3. [SPOL382] Beatrice (daughter of [SPOL371] Count Anselme, see SAINT-POL). John was Count of Ponthieu & Montreuil (1147-91), and died at the Siege of Acre (30th June 1191). [PON1391] William II (born after 1178, son of John & Beatrice) married (August 1195) [CAPE393] Alice (daughter of [CAPE389] King Louis VII, see CAPETIAN HOUSE). William was Count of Ponthieu & Montreuil (1191-1221), and died 6th October 1221. [PON1402] Mary (daughter of William), Countess of Ponthieu & Montreuil, married 1. (before September 1208) [MELL391] Count Simon (see DAMMARTIN COUNTY), who thereby became Count of Ponthieu & Montreuil (1147-91); then 2. (1243) Seigneur Matthew d’Attichy. 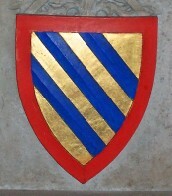 The arms of Ponthieu, as depicted on the visceral tomb of Eleanor de Castile at Lincoln Cathedral.